Rapid City Memorials is proud of the service we provide, and we couldn't say it better than our own satisfied customers! Your workmanship is excellent and we are so happy with the results. We would like yous to know how much we appreciate the outstanding care and perfection that you instill in your product. Our family will be forever grateful for your kindness and workmanship. 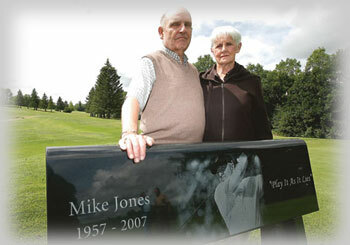 We wanted you to know that we will be recommending Rapid City Memorials every chance we get. You have proved that anything can be done on a stone. If there is a will there is a way. You have made this emotional and sentimental time for us as easy as possible, by listening to our wants and concerns regarding the stone, and making it happen. Wanted our monument to tell a story (history) of our family and this is exactly what you have done, “The impossible”. Jay, we can’t thank you enough for all the time and effort you personally put into this monument. Also, thank you for your time and patience with Dad and I, to make sure everything was what we wanted. First of all, I cannot thank you enough for the wonderful job you did on the memorial for me and my dear husband. The detail was better that what I would have ever expected and wished for. I have received a lot of compliments on your work. I really appreciate you Dad and friend bringing the headstone up on such short notice. I was so thankful that it was able to be placed before mid June. I cannot believe the care, compassion and personal extras you put in when you were assisting me with the design of the stone. I will never forget your professionalism and personalism. I am closing, thanking you again for your care, compassion and understanding in creating the perfect memory for me and my husband. We would like to thank you so much for such a beautiful job on the stone and your kindness, patients and understanding and especially for telling me to take my time in deciding on what we want to put on the stone. This meant so much to us when we had such a hard time dealing with our loss. Our relatives and friends that have come out to see this stone had so much praise for your work. You folks come very highly recommended. Thank you again and everything has been done perfect. I wanted to thank you for the really great job you have done, my family and I are very pleased with your work and for being so kind and helpful to us at this sad time in our life. My son took me to Killarney to see the tombstone you made for my parents. Words cannot express the wonderful job you did. We are very pleased with it. I know it was “different” – but that’s what we had decided on. Thank you for doing such an excellent job on Cole’s stone. We are very impressed with your craftsmanship. We’ll be sure to pass your name onto others in the future. Thank you for all your assistance – I was pleased with your service and the appearance of the memorial stone. P.S. I would not hesitate in suggesting to other people to get your firm to assist them. Just a note to express my satisfaction of the fine job your firm did in executing the headstone and installing it – wonderful workmanship. Many thanks to the manager and staff for the good work done on the tombstone and the perfect erection of the stone. We are very happy with it. We will mention your business to others. On Behalf of my brother and myself we wish to express our sincere thanks and appreciation for the beautiful workmanship on our mother’s memorial monument. It is so perfect and picturesque that our visiting it absolutely over whelmed us with joy and peace!! Our heartfelt thanks go out to you and your employees. Thank you very much for the excellent service & delivery of the fine product. We were very pleased with the stone and grateful to have it in place for the memorial service. You helped make a stressful time much easier. It was all much appreciated. I just wanted to drop you a line and let you know what a pleasure it was dealing with you folks. The job you did on the headstone was fantastic, but what I most appreciate was your ability to make your schedule match ours. We had people coming from across the country for the interment so timing was critical and we had little time to personally organize things. When I went out to the gravesite it was incredible to see the headstone in the right spot at the right time. While this may be standard procedure to you, I can tell you that in many cases, there are not many things you do not have to personally supervise. Thanks again and if you ever need a testimony to the high standard of your work, please feel free to call me. The stone for our daughter looks very well crafted and professional. I’m sure Shaunda would approve. Thank you for your kindness and efficient service. We will certainly recommend you business.